As I have begun to consolidate my thoughts swirling around my head, wanting to put pen to paper – or words to keyboard? – I had been stifled by the concern that my words, my thoughts, my feelings would be misconstrued to a negative connotation toward L.
I’m beginning to realize that I can’t let that fear continue to stifle me. Not, at least, if I intend to act on my blog title. 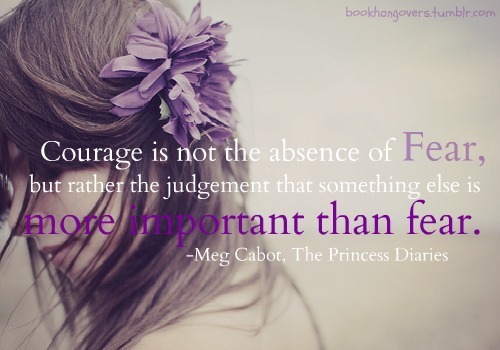 If I intend to be brave. Be happy. Live fully. I realize there is a difference between blunt honesty and tact, and I will try to always be mindful of this as I share my thoughts. But I must be true to myself. These are my life lessons and my growing moments. Please take them as you will: learn from them, ignore them, whatever your fancy. This is as much for me to get thoughts out, learn, and move forward. If you happen to enjoy my stupid quips (I promise not all posts will be serious), or learn something along the way – added bonus. But don’t come here looking to read in between the lines or with a vindictive nature. I have no intention of badmouthing him. He is a great man and I will always care for him. I own my experiences and lessons and mistakes, as I know he does his. This blog is *my* brave new adventure. My new chapter. I hope you will join me as I move forward now, on my own. And so a new chapter begins as the one prior comes to an end. Without getting into details – because the only persons that need to know them are those directly involved – after much soul-searching both on our own and with each other, together we have bravely decided to move forward on our paths separately. Many people will see this as failure. I hope they are able to see in time the strength that it takes to make such a decision. As a part of this process I have come to thoroughly understand the “walk a mile in the person’s shoes” aphorism. I can only hope that as we move forward on our journeys, we will be surrounded by support and love as we bravely search for our happiness. I still care for him, as I know he does for me. I still wish the best for him. I still consider him one of my closest friends, and I hope that in time we are able to maintain that friendship.